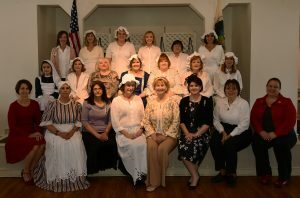 Welcome to the website of the Piney Creek Chapter, National Society Daughters of the American Revolution (NSDAR). Please enjoy your visit to these pages as you explore and learn more about who we are, what we do, our patriot ancestors, how to join us, and resources to celebrate patriotism, champion education, promote historical preservation, and research your own family history. Additional information about us can be found on the website of the Colorado State Society NSDAR and the National Society DAR. What’s in the Little Green Box? We invite and welcome you to attend any of the Piney Creek Chapter NSDAR meetings or events, meet our Daughters, and explore what we do. We generally meet the third Wednesday of the month, September through May, at 6pm, in the Southeast Metro Denver area. These business meetings include a program, social time (6-6:30pm), and business session (6:30pm to approximately 9pm). Throughout the year, we also participate in events such as commemorative ceremonies, community celebrations, parades, and workshops. If you would like to attend a chapter meeting or event or to learn more, please email our Chapter Registrar Terry Hughes, call our chapter voicemail box at (720) 722-3143, or use our Contact Us form. The NSDAR is a non-profit, volunteer, women’s service organization dedicated to promoting patriotism, preserving American history, and securing America’s future through better education. 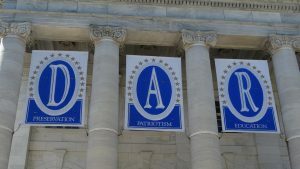 Any woman 18 years or older, regardless of race, religion, or ethnic background, who can prove lineal descent from a patriot of the American Revolution is eligible to be a member. The content contained herein does not necessarily represent the position of the NSDAR. Hyperlinks to other sites are not the responsibility of the NSDAR, the state organizations, or individual DAR chapters. Membership inquiries can be made using our Contact Us form. This website was last updated on April 7, 2019 by the webmaster. Unless noted, photos courtesy of chapter members.